If you want a crappy deal on your old games then grab this app immediately! HMV has outed a new smartphone app that will show gamers how much their old video games are worth in a trade-in for new titles. 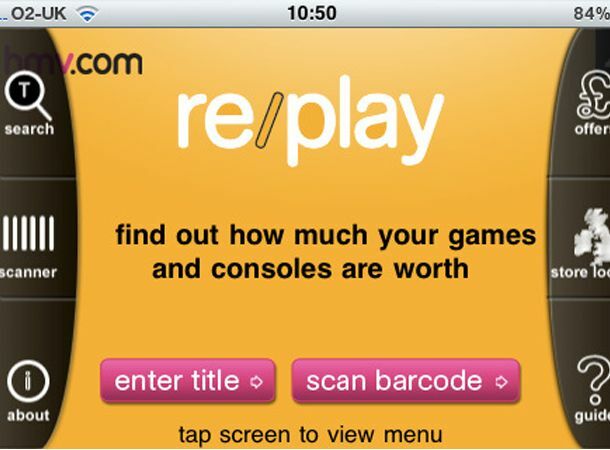 The free re/play app, which is available for Android and iPhone lets you check how you can get for a game by entering the title or using the built-in barcode scanner. Once you've checked the, most likely paltry, deal on offer from the retail outlets you can head to the store and get the asking price towards a new title. HMV says it might give first-timers the confidence to have enough to trade-in. HMV Games re/play manager Martin Baxter said: "We're incredibly proud and excited to be the-first-to-UK-market with a games trade-in app for iPhone and Android. "This ground-breaking app will not only become a must-have download for current trade-in users, but will encourage a whole new range of customers who may have previously lacked the confidence or awareness to trade their games in." To make this an even better idea, the likes of HMV could start offering customers a better deal for their games, because right now, the Amazon Marketplace and eBay are far better options for gamers.